Government agencies can become complacent and sloppy. Sometimes the complacency and sloppiness leads to corruption or worse, someone gets hurt or killed. Though the agency heads may change from time to time as political administrations change, the agency head’s immediate subordinates often remain. Often those immediate subordinates have titles such as Deputy this or Associate that. Complacency, sloppiness, corruption, and criminal conduct occur further down among agency employees because it is being tolerated and sometimes directed by the inhabitants of an agency’s Mahogany Row. Institutional complacency and sloppiness oozes down from the top. 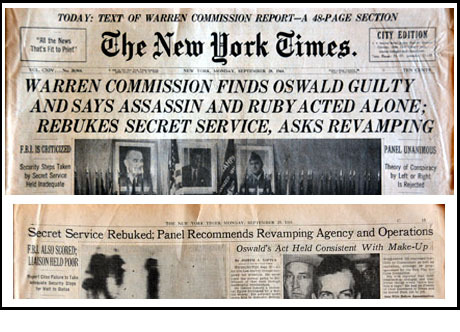 In spite of my using an image of the front page headline from the September 28, 1964, New York Times, this OpenCdA post is not about revamping the US Secret Service. The photo referring to President Kennedy’s murder and the resulting Warren Commission was used to emphasize the importance of federal agencies’ operations being subjected to regular critical Congressional oversight and then making appropriate corrections before official rebuke becomes necessary. The Warren Commission examination of the US Secret Service after President Kennedy’s murder was necessary. The changes the Commission made were long overdue and were far more expansive than the public, unclassified version of the Warren Commission Report reflected. Having watched carefully the pre- and now post-2016 election circus back in Fantasyland-on-the-Potomac, I believe top-down, Warren Commission-like examinations of both the Federal Bureau of Investigation (FBI) and the US Department of Justice (DoJ) are also critically necessary and need to begin soon. There appears to have been DoJ and FBI malfeasance, criminal conduct, and the abuses of investigative authority including misleading and possibly outright lying to the FISA Court to obtain FISA Court warrants to surveil persons associated with the Trump Campaign and possibly candidate, nominee, and now-President Trump himself. Sensitive information selectively leaked from Special Counsel Robert Mueller’s investigation and public information found in recent Congressional hearings strongly suggest that before and after November 8, 2016, some headquarters executive and supervisory level officials of both the FBI and DoJ apparently looked into the funhouse mirrors adorning their Mahogany Row office walls. Apparently they saw a messianic face looking back at them. Perhaps believing the image they saw in their mirrors to be above the laws of the United States, they may have concluded they had been divinely anointed to undo President Donald J. Trump’s election, in their minds an unthinkable wrong committed by “deplorable” voters on November 8, 2016. If the DoJ and FBI abused intelligence assets and statutory authority, the abuses represent a grave threat to the national security. They completely undermine the trust and confidence the citizens of the United States must have in these agencies. The election of Donald J. Trump to be the 45th President of the United States shocked many people including Democrat nominee Hillary Clinton. Clinton and many of her Democrat and Republican supporters were supremely confident she would coast to an easy victory in the November 2016 election over the brash businessman from the New York City borough of Queens. After all, Donald J. Trump had little political experience in the rarified smog and stench that is the Washington, DC., swamp. In the minds of many Clinton supporters, including some in the FBI and DoJ and among some Fools on the Hill, status quo corruptus not only would but must continue unabated so the perpetual swamp dwellers could continue to blissfully ignore the folks outside the National Capital Region, often called the folks back home. Then the folks back home cast their votes, and Donald J. Trump won the election. Within hours of Donald Trump being declared the President-elect, an organized effort was activated to not just defeat him in the 2020 Presidential election but to obstruct by any means necessary his ability to fulfill the duties of his office. In the organizers’ view, President Donald J. Trump must not be allowed to complete his term of office: He must be either impeached or otherwise removed from office. One of the impediments thrown at President Trump was an allegation that the Trump campaign had “colluded” with the Russian government to unlawfully manipulate the outcome of the 2016 Presidential election. “Collusion,” is an agreement between two or more parties to do something secretively and sometimes though not always, unlawfully. Oddly enough, it was during the campaign of Republican nominee Trump that he first made the suggestion of a “rigged” election, a suggestion scoffed at by Clinton and her cronies when she and they assumed her victory was a foregone conclusion. It was only after Clinton was defeated in the lawful election that she and and her cronies seized on the “collusion” theory. Thus far, the public has been shown no evidence that would enable a reasonable man to conclude that now-President Donald Trump or anyone in his campaign acting at his direction had committed any criminal act in furtherance of unlawfully manipulating the outcome of the 2016 election. However, some information leaked unlawfully and some released lawfully by various sources is beginning to show that some high officials in the FBI and DoJ may have conspired criminally to violate laws of the United States in an effort to ensure that Hillary Clinton would win the 2016 election. They also wanted an “insurance policy” just in case Donald J. Trump was elected President by some cosmic mistake . It appears the “insurance policy” may have included misusing their official positions to engineer the appointment of a Special Counsel to investigate allegations that the Trump campaign and maybe Trump himself had “colluded” with the Russians to manipulate the 2016 election in Trump’s favor. Given that there has been no evidence thus far revealed to the public that would support a criminal prosecution on charges that Trump et al had criminally conspired with the Russians (or anyone else for that matter) to unlawfully manipulate the 2016 election outcome, it has to be considered that the desire for a Special Counsel investigation was not to produce evidence admissible at a criminal trial. Now it seems more likely that the “insurance policy” underwriters wanted an investigation that would produce something else: Opposition research that would be selectively leaked to biased and unquestioning “journalists” and then presented to the House of Representatives as something resembling evidence in an impeachment proceeding. Responding to growing pressure for a Special Counsel, Attorney General Sessions declared that since he had been actively involved in Republican nominee Trump’s campaign, he had to recuse himself as AG from involvement in the decision to appoint a Special Counsel to investigate the alleged “collusion.” With Attorney General Sessions’ recusal, the decision to appoint a Special Counsel was left to Deputy Attorney General Rod Rosenstein. Relying on the thinnest of “evidence” to justify his decision, Rosenstein quickly appointed Robert Swan Mueller III as Special Counsel. Mueller was a former FBI Director who was also former FBI Director James Comey’s mentor and personal friend. Comey had been the FBI Director under Obama Attorneys General Holder and Lynch. Comey’s involvement as FBI Director in the premature exoneration of Democrat presidential nominee Hillary Clinton is the subject of Congressional investigations as well as a DoJ Inspector General’s investigation. After his appointment by DAG Rosenstein, Special Counsel Mueller staffed the Office of Special Counsel with unabashedly pro-Clinton DoJ attorneys and FBI investigators. Many of them had contributed large but legal donations to the Clinton campaign. Many of these same supposedly unbiased and professional attorneys and investigators had expressed varying degrees of personal animus, some bordering on hatred, toward then-candidate, then-nominee, and now President Donald Trump. As I pointed out in my OpenCdA posts on December 2 and December 13, 2017, the vast majority of offenders at DoJ and the FBI are most likely to be found on or near the Mahogany Row floors of both the Robert F. Kennedy Department of Justice Building and the J. Edgar Hoover F.B.I. Building. Investigations and charging decisions involving public officials are almost always done only with the approval from Main Justice. To get a better understanding of just how readily some DoJ attorneys are willing to abuse the authority and color of law and violate the civil liberties of US citizens, read Licensed to Lie — Exposing Corruption in the Department of Justice. The author, Sidney Powell, served as an Assistant US Attorney for ten years in Texas and Virginia. The book is available through the Kootenai & Shoshone Community Library Network as well as through online and retail booksellers. Notably, Licensed to Lie was copyrighted in 2014, at least a year before President Donald Trump even announced his candidacy. It focuses on the outright illegal and longstanding practice of some DoJ attorneys withholding excuplatory evidence from the defense, a practice forbidden by the US Supreme Court in its 1963 ruling in Brady v. Maryland. If you believe that Brady violations by federal prosecutors have stopped, read the article posted January 8, 2018, on azcentral.com, headlined Cliven Bundy walks free as federal judge dismisses Bundy Ranch standoff case. U.S. District Court Judge Gloria Navarro said federal prosecutors acted recklessly and engaged in a “deliberate attempt to mislead and distort the truth” by failing to turn over evidence that could have helped exonerate the four defendants. The now-dismissed Bundy prosecution case was prepared and prosecuted by Assistant US Attorneys from the District of Nevada. The misconduct referred to by Judge Navarro is on them, not the newly named interim US Attorney, Dayle Elieson. She was appointed only within the last few days by AG Sessions. AG Sessions detailed Interim USA Elieson from Texas although she may not ultimately be nominated and confirmed as the US Attorney for the District of Nevada. It was absolutely predictable that USA Elieson’s interim appointment would offend political hacks and swamp dwellers who traditionally have preferred political loyalty to the lawful, unbiased, and ethical administration of justice. The kinds of egregious behaviors concerning the runup, execution, and aftermath of the 2016 election are being investigated by various Congressional committees and the DoJ Inspector General. Regardless of the conclusions drawn by these officials, I still believe that nothing less than a Warren Commission-like investigation of both the DoJ and the FBI needs to happen. Preliminary public information indicates the nation’s intelligence assets (e.g., FISA warrants) and criminal and election laws have been used and abused to try and manipulate the outcome of the 2016 presidential election. The desired outcome of some is that President Donald J. Trump will not complete his term of office. Trying to manipulate the election outcome in that way would be bad enough. If the nation’s intelligence assets and criminal conduct have been used abusively (“insurance policy”) to try and drive President Trump from office, impeach and remove him from office, or harm him sufficiently to cause the 25th Amendment to be invoked, those responsible need to be identified, tried, and convicted in a court of law. The national intelligence assets, especially but not limited to those permitted by FISA, are too valuable to lose — but only as long as they are used lawfully. Federal employees who will use unlawful means to remove or harm a duly elected President of the United States are unlikely to hesitate to use those same means against us “deplorables” when it would be expedient. That should horrify all US citizens. It is crazy. Please write something nice and soothing about this recent shutdown. I am blaming those who voted, “No” as resistors and obstructionists as aides in enhancing the revenue caused by illegal drugs and their transport to this country and control through addiction. Of course they do not want the wall … our leaders [are] controlled by drug cartels and pardoned by previous Presidents. I am horrified and I am not a federal employee, thank goodness. I made your typo correction inside the brackets. The hyperbole and hysteria about the G’s furloughing non-essential employees just before an otherwise news-weak weekend gives Bezo’s Bozos at the Washington Post, Sulzberger’s Slimes at the New York Times, and the SAG-AFTRA members of the electronic skews media something to hyperventilate about in their futile effort to stave off journalis mortis. Bill, I have read your response to Stebbijo several times. I can give it a “soothing” rating but, unfortunately, I just cannot give it “nice” rating. The nicest thing I can say about the skews media is that it is doing a collectively admirable job incrementally achieving its much sought-after mediocrity.